In the dog or cat, this would be an easy surgery as general anaesthesia using isoflurane gas is very safe and predictable in these two species. 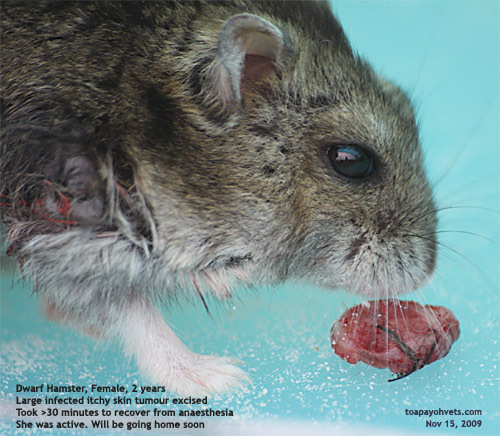 In a 2-year-old dwarf hamster, the successful outcome depends greatly on the anaesthesia. 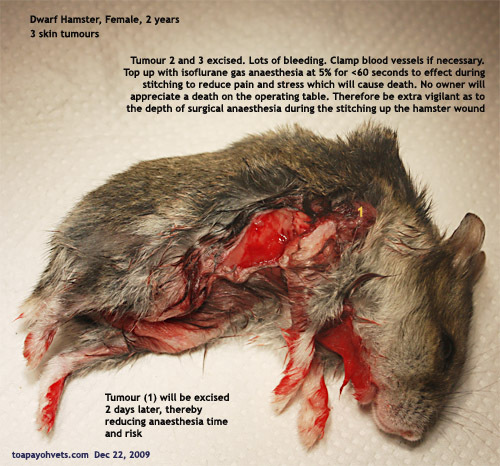 Insufficient anaesthesia may kill the hamster due to great pain and fright from surgery. Lots of movement hampered surgery. Death could be due to fright during restraint and not due to anaesthesia. In the dog and cat, pre-operation examination and blood tests are helpful. 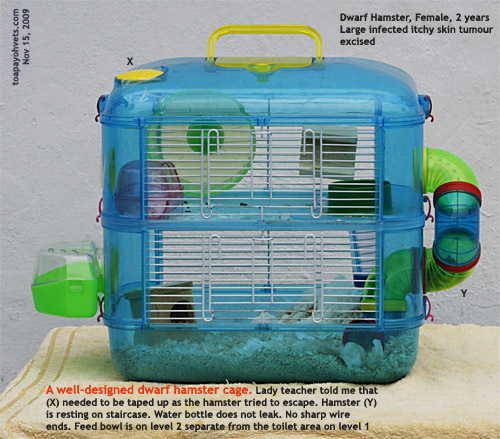 In the dwarf hamster, ask the owner about the amount of stools passed and water drank. In this case, the lady owner was very observant. The hamster was eating as faecal pellets could be seen. She noted that the hamster recently drank at least 3x more water than normal in a week by judging the amount of water in the water bottle drank per week. Based on her observation, the hamster was drinking 18 ml/day compared to the normal 5 ml/day. This polydispsia is abnormal. Oral Baytril antibiotic was given on Day 1 and 2. 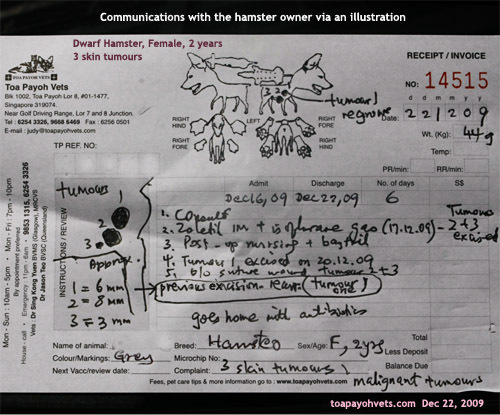 Surgery started on Day 3 as the hamster was suffering from a red itchy infected skin tumour. 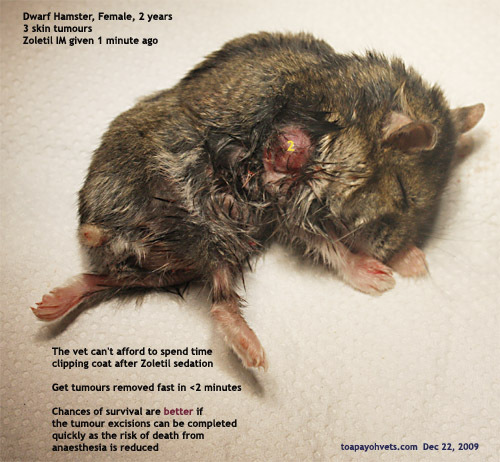 It is extremely difficult to see the signs of surgical anaesthesia in the hamster under isoflurane gas (gas into a plastic container with the hamster inside) and Zoletil sedation. A bit more will mean death. So, it is a matter of observation of anaesthesia to effect. What does that mean when the vet can't check the pedal and eyelid and other reflexes as in the dog? It is just not possible. "Count to 10" I advised my assistant when the hamster has been placed in the container. "See the movement and the eyelid closure". This is not scientific. We took the hamster out for surgery. When it moves, we put it in again. This happened 3 times. By the 3rd time, the hamster looked "dead". Life had been sucked out of her body. "The hamster has died," I tried to revive it by rubbing the skin of its neck above the shoulder area. "Can give Biolapis," my assistant proposed. I was busy trying to revive this hamster. Blow air via a 3-ml syringe into its nose area may be useful. In this case, my assistant put a drop of Biolapis which is an oral electrolyte for small animals like rabbits and hamster. An oral respiratory stimulant and oxygen would be useful. The hamster was still breathing as I could see its chest movements. I left it alone, under the warmth of light. In around 30 minutes, it was up and alert. As if it had a good lunch-time nap. The Caucasian school teacher was very happy as she was prepared for the worst. 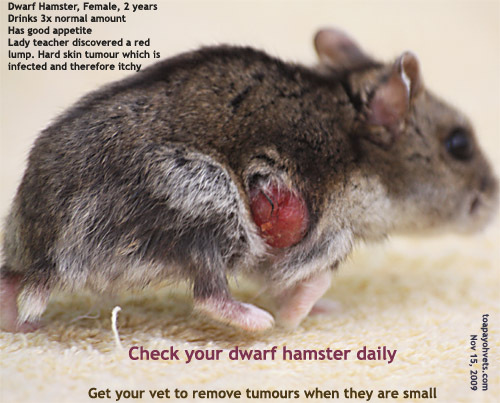 Always examine your older hamster daily for small tumours. Small tumours less than 3 mm in diameter take less than 1 minute to remove and the chances of survival are very high. Not all stories have happy endings as vets are not Gods. Therefore, do check your hamster daily for tumours. 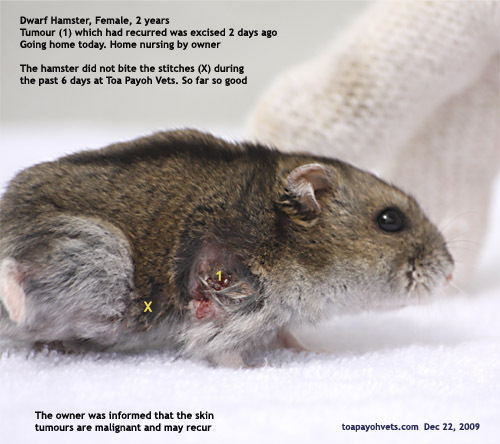 In December 2009, the hamster had another skin tumour. Superficially, it looked like the previous tumour had recurred in around a month (see picture, left of the first tumour prior to excision). The vet consulted advised medication. Unfortunately, the owner over-squeezed the syringe of medication and had to replenish his stock. I happened to answer the phone. I advised a review and surgery as the hamster's tumour would become larger and larger and become infected and itchy. Surgery would be a high risk but would buy her some time to live and a better quality of life. No vet can guarantee that this time the hamster would not die on the operating table. Of course, it would be better for the reputation of the vet not to perform surgery as you would see later that there were challenges of stitching a large skin wound from the armpit to the hip. It was a very large incision. 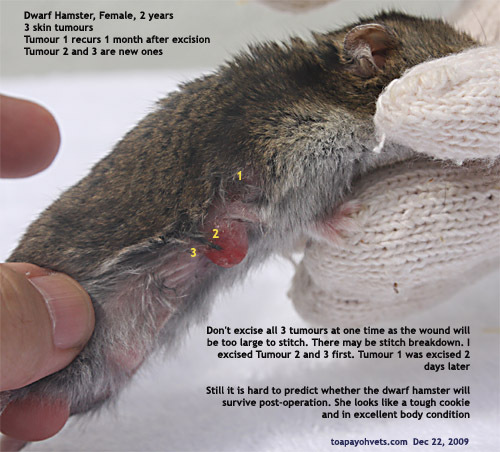 The hamster might bite off the stitches and there would be a very large hole in her lower body. A successful outcome is what the owner wants. Nothing less. This was a hamster who was in excellent body condition. She looked younger than her age and was extremely active. Galloping like a racehorse across the table. Turning around such that I could not take good photographs. At one time, the hamster looked as if she had died. Eyelids closed. No respiratory movement after another bout of isoflurane gas anaesthesia to continue stitching. I dislike such lengthy surgeries but this could not be helped as the tumour 2 was large. The wound was larger after excision of tumour 2 and 3. I was worried that the hamster would just bite off all the stitches and exposed a big hole in her lower flank. That would be impossible to re-stitch. 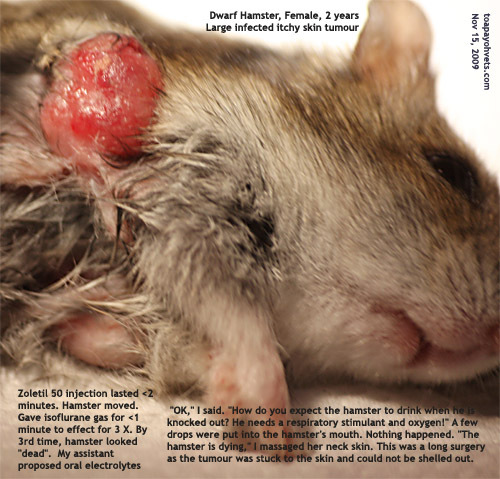 Hamsters don't wear e-collars nor are they bandaged. They don't like them. So, they have all time in the time in world to bite off any stitch. I used 6/0 absorbable sutures which are almost as thin as the hamster's hair. The good news is that she survived the surgery and went home on day 6 and should be spending Christmas with a boy and his family who take care of her and nurse her wounds while her owners were overseas. Miracles do happen. Sometimes. But vets are not Gods. 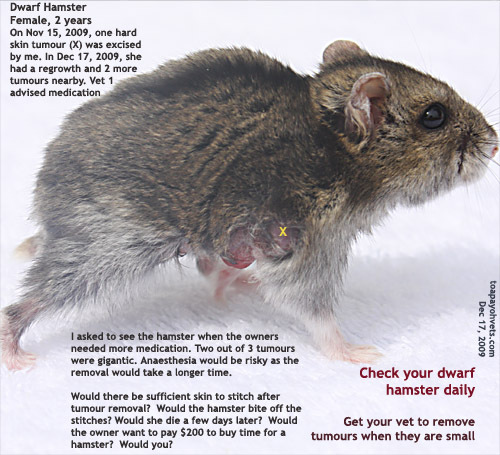 Don't wait till tumours are large to seek veterinary treatment. Note that some vets just don't do hamster surgeries as vets are also judged on the outcome of their performance. If the hamster dies on the operating table, much cursing will be send forth as some owners expect "free" services for unhappy outcomes. 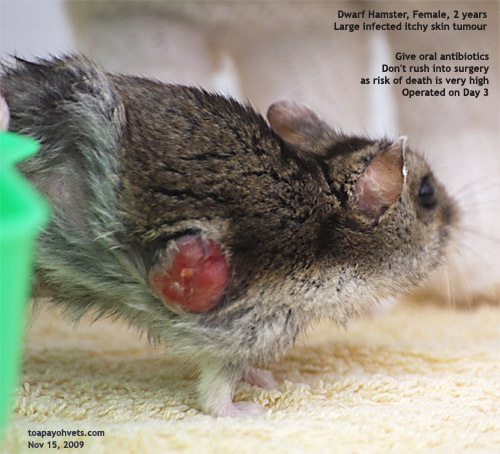 So, it is understandable that some vets prefer not to get into dwarf hamster surgeries.